Set in 1970, “The Soul of Blue Eye” tells the story of Dusty Springfield’s decision to record her Platinum selling hit Son of a Preacher Man for Atlantic Records, and the struggles she had as a white gay woman singing black soul music during the tumultuous 1960’s. Besides having a hit show, “It Must Be Dusty” in England, Dusty was influential in the discovery of Jimi Hendrix and Led Zeppelin, and produced dozens of Billboard top 100 hits in her career. Producers Bekian and Brunt have a feature length script that they are looking to produce with Nicole Kidman as their first choice to play Dusty Springfield, and have made this short to give people a glimpse into the full story they hope to make. “The Soul of Blue Eye” stars Paige Segal as Dusty Springfield, and will be shown at the Laemmle NOHO 7 Theater in North Hollywood on Saturday, July 26th 2014 at 3:15pm. For more information, email bob@loyalstudios.tv. 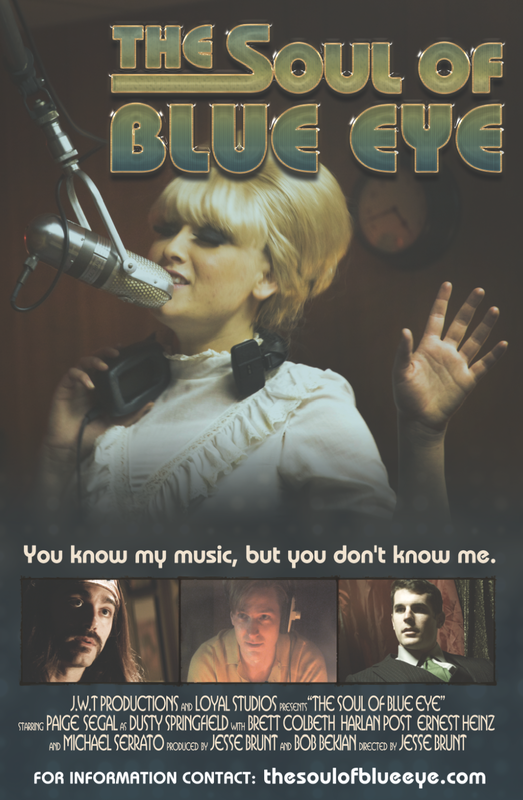 Set in 1970’s Los Angeles, the film “Soul of Blue Eye” explores Dusty Springfield’s life at the pivotal moment where the term ‘Blue Eyed Soul’ become known through her album “Dusty in Memphis.” Its focus is on the struggle she faced daily that came to a head at one interview with Atlantic Records. Her road was not an easy one. Dusty fought a constant battle between her love for her girlfriend, and keeping up appearances in the public eye. Her relationship suffered under the suffocating stress of living in a society plagued with rampant homophobia. Coming out in that time period would likely promise a lifetime of social bullying for both her and her lover. “Son of a Preacher Man” is one of the most recognizable songs in soul music today. It’s played on thousands of shop radios, kept alive in classic rock/soul stations, and the smooth, smoky-edge timber of Dusty’s voice influences artists of all ages today. The song, originally offered to Aretha Franklin, cemented Dusty Springfield’s career into the heart of American music history despite her blond-haired, blue-eyed British origins. She once commented that if people only knew her by her music, they would think she was a black woman. The music industry owes much to her efforts and powerful charisma, not just because of her voice, but of what she accomplished behind the scenes. Were it not for her influence, the world may have never known the legendary rock sounds of Led Zeppelin, or marked the 60’s with the guitar riffs of Jimi Hendrix. She is responsible for convincing the agents at her label to listen to Led Zepplin’s music, and ultimately sign them. The death of Jimi Hendrix, hit her hard. She lost an amazing colleague, and a long-time friend. “Soul of Blue Eye” stars Paige Segal (“The Day the Music Died”), who gives a spark of life, attitude, and vulnerability to the persona of one of the worlds most famous soul singers.